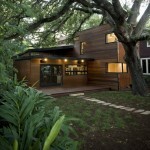 Brian Dillard Architecture have sent us images of the Dry Creek House in Austin, Texas. The Dry Creek House was designed for a couple looking to build a new home that reflected their appreciation for simple, restrained design. 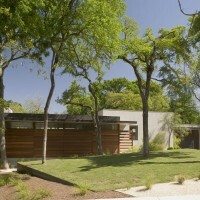 It is located on an urban lot in Austin, TX with a dry creek running behind the house. The house is 2,700 square feet which includes two bedrooms, three baths and an additional, detached cabana space to serve the pool. The C-shaped plan focuses your attention towards the natural landscape afforded by the creek while shielding your view from the otherwise familiar neighborhood that surrounds the house. Constant views into the courtyard from the house make the project feel larger than it is with the exterior spaces functioning as extensions of the house. 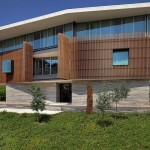 The use of warm materials such as ipe, white oak, and lueders limestone contribute to giving the house a sense of warmth to balance the use of colder materials such as concrete, glass, and steel. The open plan is arranged to maintain a sense of privacy for the necessary portions of the house when entertaining guests in the main living spaces. 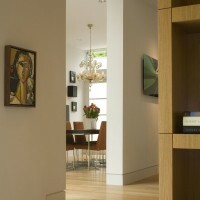 Overworked details that tend to call attention to themselves are avoided in the design. Instead, the house finds elegance in its simplicity, sometimes acting as a quiet backdrop for the thoughtfully considered landscape (D-Crain Design & Construction), furniture (Tracy Overbeck Stead), and artwork of the house. 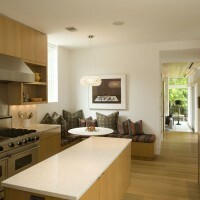 Visit the Brian Dillard Architecture website – here.